Being a public defender sometimes isn’t all that it’s cracked up to be. The salary is low, the case loads can be incredibly overwhelming, and you’ll find that you’re very lucky if your office receives ample funding from the state. The director of one overburdened public defender’s office had apparently had enough with his state’s continued failure to properly fund his work. He did something drastic and took the law into his own hands so that his indigent clients could receive competent defense in the court system. 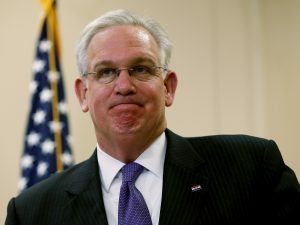 In a rancorous letter, Michael Barrett, the director of the Missouri State Public Defender System, ordered that state Governor Jay Nixon, a graduate of the University of Missouri School of Law, appear in court to come to the defense of a poor criminal defendant. Barrett notes that Nixon has consistently and repeatedly vetoed and cut funding for the state’s public defender system, forcing it into such a state of financial disrepair that it currently ranks second to last in the entire country. According to Barrett, in 2015, Nixon cut $3.47 million from the state’s public defense budget, and in 2016, citing “fiscal discipline,” he again sought to restrict its funding, this time by 8.5 percent. As of yet, I have not yet utilized this provision because it is my sincere believe that it is wrong to reassign an obligation placed on the state by the 6th and 14th Amendments to private attorneys who have in no way contributed to the current crisis. However, given the extraordinary circumstances that compel me to entertain any and all avenues for relief, it strikes me that I should begin with the one attorney in the state who not only created this problem, but is in a unique position to address it. Fund your public defender offices, state governors, lest you be conscripted into the defense bar against your will.